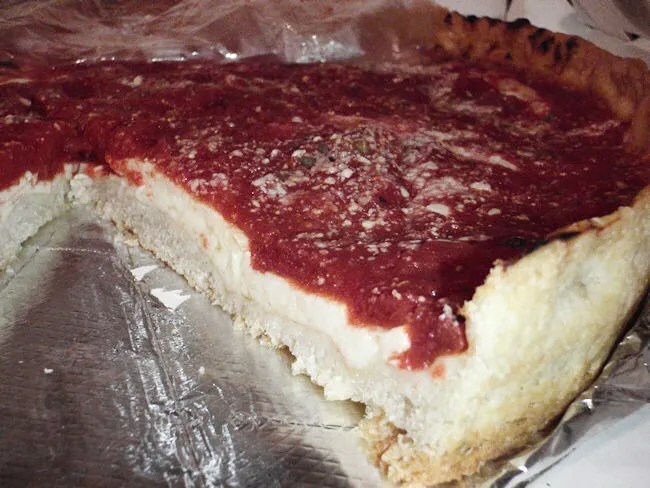 When most people think of “Chicago-Style” pizza, they instantly go towards Giordano’s stuffed pizzas. 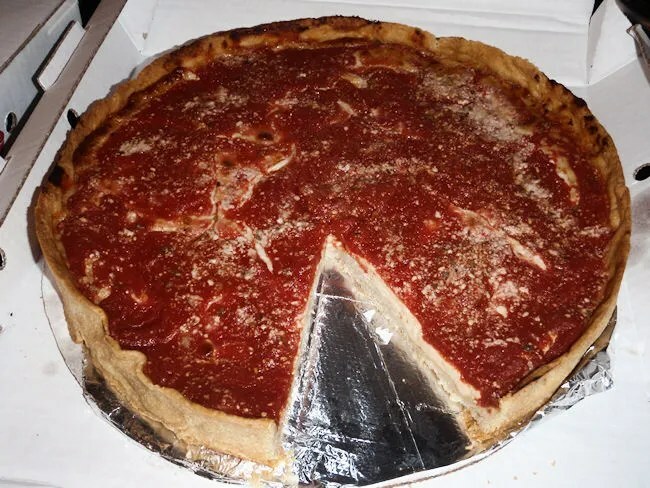 I do like me some Giordano’s, but when I think of the Chicago style deep dish, I think of Lou Malnati’s. I love Lou Malnati’s pizza. It’s not the stuffed pizza like Giordano’s. It’s an entirely different animal that incorporates everything I love about the Chicago deep dish pizza. The cold sauce. The inverted layers. The fat heavy crust. All there. We spent Christmas Eve at my parents house. First doing to extended family thing with my grandma then the immediate family think with my parents, aunt, and my brother’s family. That ended around 7:30. It was then time to drive back north to J’s parents to wake up and celebrate Christmas Day with them. 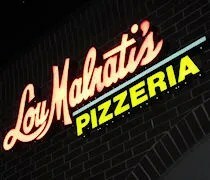 J’s mom wanted to order a pan of lasagna for Christmas Day at J’s grandma’s and she knew that I was a Lou Malnati’s fan. When she put in the order for lasagna, she also put in the order for two pizzas. Up until fairly recently, Lou Malnati’s was a north side thing. They really didn’t have any locations near my in-laws house in the south suburbs, but they’re finally expanding to White Sox territory with four south side stores. The closest one now is just a mile or two away on West 95th Street in Oak Lawn’s downtown. The pizzeria is in a fairly new building right along the busy thoroughfare. There is no parking on 95th Street, but there is a large parking lot behind the building that serves several businesses. The entrance is actually on the “back side” of the building and not on the street side. Since it was Christmas Eve, I didn’t actually get a chance to go inside. The pizza was already at J’s parents by the time we got there and the business was closed for the night. I needed to make a gas station run to turn in some lottery tickets from my parents Christmas Eve and decided to head to the business to see what I could see from the outside. It wasn’t a whole lot. There’s a hostees station right inside the door and that’s about all you can see. There’s really nothing else to see as the pizzeria is carry-out/delivery only. I had a pretty big dinner at my parents house, but how can you turn down pizza. We opened up both the boxes to see if we could figure out which one was plain cheese and which was pepperoni. The pizzas don’t come cut in to slices when you do carry out. The restaurant claims the pizzas travel better as a whole pizza. We cut in to one and by looking at a cross section, determined there were no pepperoni’s. J likes the cheese pizzas, so she popped a slice in the microwave real quick to warm up. I’m more of a cold pizza eater, so I cut in to the other one thinking it was pepperoni, but we couldn’t find any pepperoni’s on that one either. It really didn’t matter to me. The pepperoni is not actually what makes this pizza so good. It’s the basic elements that were all there that make this pizza so good. The construction of a Lou Malnati’s pizza is similar to what you find at most Chicago style pizza joints. The rich, flaky, buttery crust is not as deep dish as you would think. The bottom crust is actually very thin. The walls of the crust while tall, are also pretty thin. It’s the ingredients that build this pizza to the deep dish…not the crust as so many imitators outside of the city do to make “Chicago-Style” pizza. After the crust, there’s a thick layer of cheese followed by a cold pizza sauce. The uniqueness of Malnati’s is in that cold sauce. It’s a thick, chunky sauce that is not cooked until it goes in to the oven with the pizza. most part, I like thin crust pizzas and that’s probably why I like Malnati’s so much. Yes, it’s a knife and fork pizza, but it’s not that way due to thick crust build up. That thickness is all toppings. This Malnati’s in Oak Lawn is going to make decisions difficult for me when we go to J’s parents. 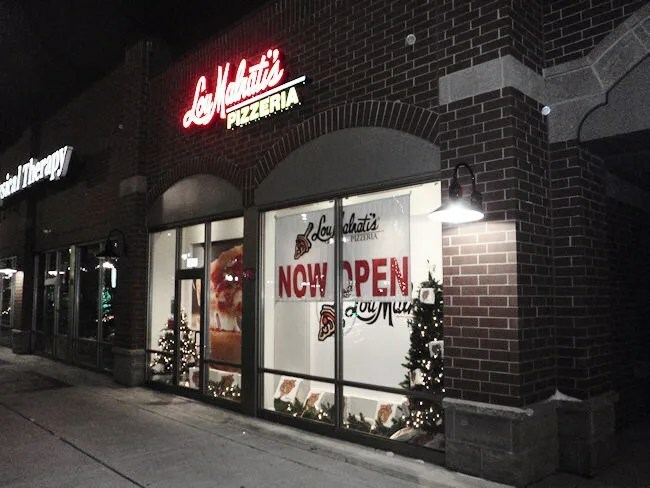 My favorite pizza place in the world is only a few blocks from this new Malnati’s. I like both pizzas and it’s going to be hard to choose. Guess I could always get both and take one home….